Surfability UK – the first project that The Gumby Legacy is fundraising for. This community interest company aims to make surfing inclusive and available for children with disabilities. 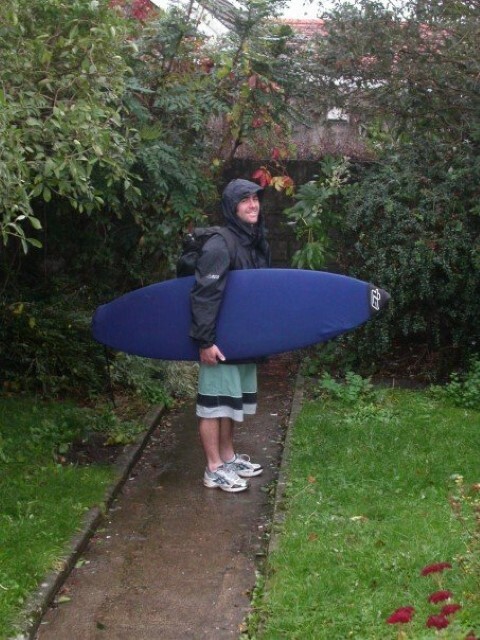 Surfsup no matter the weather – you get wet anyway! He was passionate about the sea and all things in it. He surfed as much as possible wherever and whenever he could. Our parents gave us the great gift of enjoying the water and I remember ‘teaching’ my little bro to swim in our huge, plastic, temporary pool when we were really young. Also, the hours and hours we spent in the ‘proper’ pool once it was there and the training sessions in school swimming squads. One of the strongest memories I have of our granny Brooke was her throwing spoons to the bottom of the pool and us diving down again and again to bring them up. My mom remembers him being a daredevil and almost scaring the life out of her when, at 4 years old, he climbed the huge bottle brush tree and proceeded to jump into the pool from a ridiculous height. All she could do was watch in case he lost his focus and she made the situation worse. Suffice to say he made it and went on to do many, many more crazy, exhilarating water based things. When Gumby was in the UK over the years, he often helped out at events that I and the NPT Children Centre’s physiotherapy team was involved in. I remember him thoroughly enjoying each experience and being amazed at the tenacity of the children and how much enjoyment and pleasure they got out of life. He also got on really well with all of my friends and colleagues in the team and I know that he would be pretty stoked at the thought of us getting these kids in the water and experiencing his most favourite thing to do. Check out Surfability UKCIC to see what Ben and his team offer. Check out 10 reasons why EVERYONE should surf and therefore why this is such an awesome project for the Gumby Legacy to support and here for our fundraising news. This looks very interesting. I will publicise this on both Twitter and Facebook so that the people who follow me will have access to this brilliant information. Thank you Olivia. Hope to see you on the 19th. Apologies so long to reply. Being fairly new to all this I only just saw there were comments in the spam folder that weren’t!